They are slightly safer on the deck, but not much. 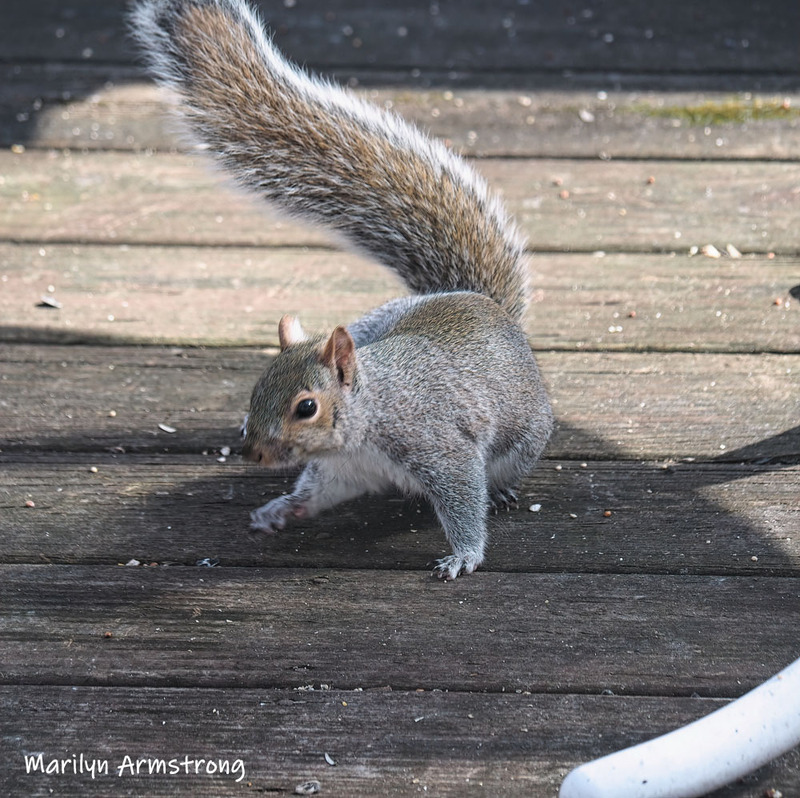 The squirrel can hide under the tables and chairs and the hawks can get under there. There’s no room for them to spread their wings! But we have a definite excess of hunter compared to prey and that IS unusual. The prey has been more or less wiped out. Eventually, the predators will get sick or starve and die. I suppose these things are cyclical in nature. That was my first thought: Getting its breakfast in form of a squirrel…. Very thought-provoking stuff and one subject we discussed on Saturday with our friends ‚en campagne‘ where we rented their gite for a few days. I commented on the lack of bird song in their huge and quite wild garden, saying that we have far more birds in ours and how strange that was, us being just 30km from Paris and they in the middle of ‚nowhere‘ with only fields, hamlets, waterways ….. And he said with great sadness that nowadays living in the countryside meant that all small wildlife is being destroyed by the intensive farming going on. Pestizides are being sprayed on the fields, killing the habitants of the earth, thus killing the birds‘ food and hence no more of them being able to live. They hardly have any bees any more, no butterflies to speak about, not many bugs….. one conveniently forgets about that side of ‚our food chain‘ and only sees ‚produced in France‘. One neighbour of said friends told them that HE, a master ‚gardener‘ (there is another word but I can‘t think of it), only drinks organic wine, as a French! He says so much nitrates are being sprayed on the vines that his body can‘t take the ‚poisoning‘ any more. Makes you think! Locally, this is a “poison free” zone except for the neighbors who use it in their garden (morons!). This is because we are in a watershed and the aquifer is very close to the surface. You poison that and there will be NO water for anyone to drink. People are so stupid. So our food is safe. But because of the extended urbanization almost everywhere, animals are being pushed into whatever few areas remain that are more or less wild — and this is one of them. If looks wild to us … and it is. But it is small compared to the number of hunters that are forced to try to find food in it. Too many hunters and too few things to hunt. I had a Hawk come into my yard and swoop down and grab a squirrel -it was astounding and horrifying at the same time. It was during a snowstorm and I assume the Hawk was hungry. I think more hawks are eating other birds. They didn’t use to but they have run out of other things to eat. 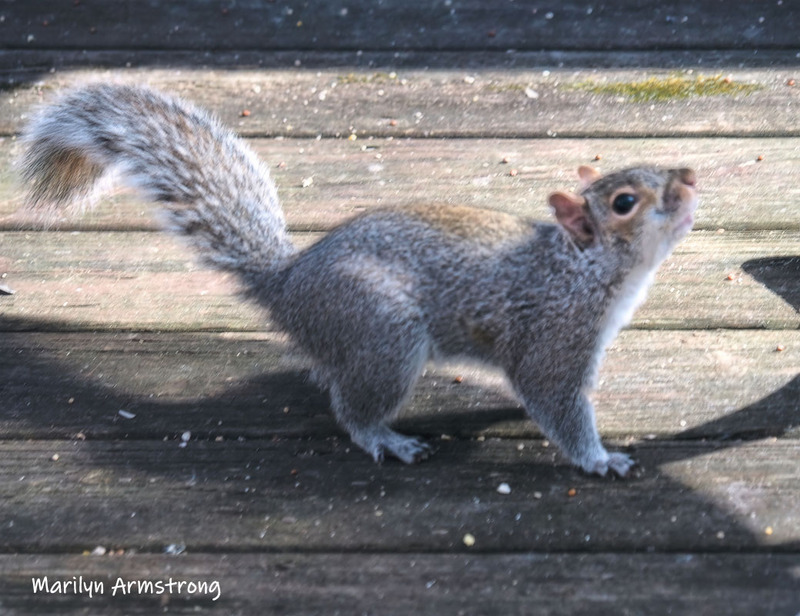 No more chipmunks or rabbits and there are many fewer squirrels. There are not nearly enough small mammals for them to eat. We really used to have dozens of chipmunks. They were almost a plague and now they are absolutely gone, along with the rabbits. We have them flying over our little city. As one landed on a very high tree branch, the squirrels froze in place. Not a muscle moved. The birds stopped singing. When the hawk finally left our back yard came to life again! Many hawks have taken to living on ledges of buildings. They eat pigeons and rats and cats. Falcon especially. Ironic because pigeons were originally rock doves who round cities a good place to live. 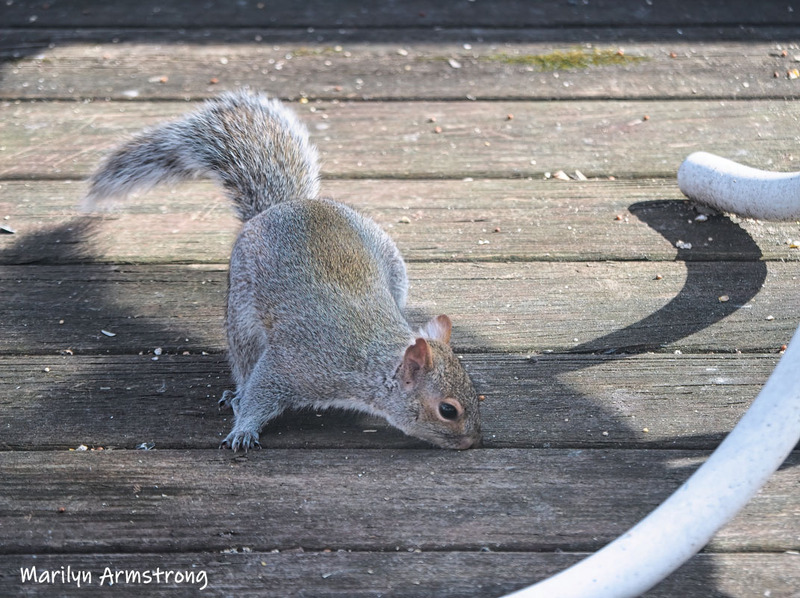 The squirrels were literally hiding under the metal table on the deck. I could understand why. It’s safer than the trees. The hawks can’t get to them under the big flat table. No room for them to spread their wings. So they can charge up the pole, get some food, then run back down and huddle under the tables and chairs. We seem to have quite a crew of squirrels! Those squirrels look so fat and healthy, and the birds do too, no wonder the Hawks are hanging around. So many of them have scars and open wounds. There are a LOT of predators and there are hawks that specialize in eating other birds, but if they can’t find juicy birds, squirrels will do. Yesterday, there were squirrels early in the morning and today there were doves and a few nuthatches, Doves, juncos and very quick trips by Titmouses. No finches at all. The one flight by the Cooper’s Hawk may have been one of many. I only saw one flight. All the birds and squirrels are scared. Meanwhile, since our neighbors decided to use “RoundUp” on the weeds, we don’t see Robins anymore either. They used to nest on our porch and flock to eat all the grubs on our lawn. 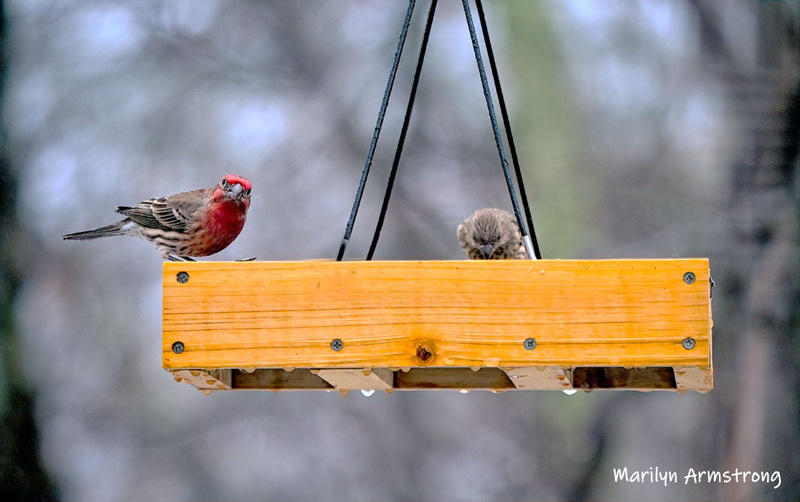 In the past days, very few birds have been finding their way to the feeders, and all of them are jumpy and nervous. 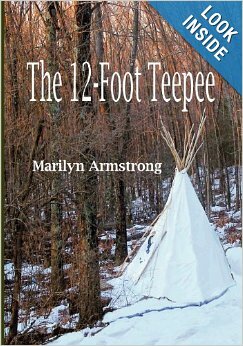 Between humans and poisons and nature’s own hunters, it makes it hard for them to survive. Many DON’T survive … and eventually, the hunters don’t live either because the food they need vanishes. I think that RoundUp is bad news….. I hope the squirrels will be okay. But that’s nature, I guess. Though I worry about the disappearance of all the animals from around your way. Something will happen. I just have no idea exactly WHAT it will be. We live in the woods and it looks very big to us. But it’s not big for all the coyotes and bears and weasels and raccoons and hawks and eagles. Big birds and little birds, squirrels and what remain of the rabbits and if there are any chipmunks left … For them, these woods are not nearly big enough and every time we build something more in them, they grow smaller.